Attachin, a fusion protein with molecular weight of 30 kDa, is demonstrated to stimulate cell attachment. Both hydrophilic and hydrophobic polymer have been shown to be effective as the attachment surface. Various types of cells promptly attach to the surface precoating Attachin in half an hour, and then spread in the media with or without serum supplement. Attachment efficiency of Attachin is better than that of collagen or fibronectin. Attachin has been used in the culture of smooth muscle cells and bladder epithelium cells of dog, bone marrow stem cells of human, cartilage cells of rabbit, mouse fibroblasts applied in artificial skin, capillary vessels, artificial bone and joins. Attachin also can be used in the production of vaccine and therapeutic protein in a high cell density culture system or serum-free culture system. Attachin has been shown to stimulate cell attachment on hydrophilic cellulose material as well as hydrophobic polymers. Attachin enhances bioadhesive property of biomaterial, form a stable tissue structure, so that it is a perfect intermediate between biomedical material and cells. It can enhance attachment of epidermis, endodermis, and cartilage cells - especially in tissue engineering - including artificial skin, bone, cartilage, blood vessel, and other artificial tissues. Attachin helps cells attach and grow in tissue and promotes secretion of growth factors and extracellular matrix making artificial tissue stable like a natural tissue. 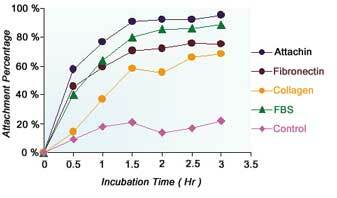 Attachin helps to produce vaccine and protein in high-density cell culture with microcarriers. In a stir-bioreactor, Attachin can help cells attach stably and promptly on microcarriers and reduces cell damage caused by mechanical shear force. Attachin is a fusion protein constructed by molecular biotechnology, and its molecular weight is 30 kDa. The purity of Attachin can reach up to 99% and above. Attachin is demonstrated to help cell attachment, both hydrophilic cellulose material and hydrophobic polymers have been shown to be effective as the attachment surface. Various kinds of cells promptly attach to the surface of the mentioned materials in, and then divide in the medium with or without serum supplement. Attachin can enhance bioadhesive property of biomaterial, form a stable tissue structure, so that it can be a good intermediate between biomedical material and cells. Attachin can enhance attachment of epidermis, endodermis, and cartilage cell, especially in tissue engineering, including artificial skin, bone, cartilage, joint, blood vessel, and other artificial tissue. Attachin can help cell attach and grow in tissue scaffold normally and promptly, and promote secreting growth factors and extracellular matrix, make artificial tissue stable, like a natural tissue. Attachin can take place attachment factor in serum as an additive in serum-free medium and help produce vaccine and protein in high-density cell culture with microcarrier. In a stir-bioreactor, Attachin can help cell attach stably and promptly on microcarrier so as to reduce cell damage even dying from mechanical shear force. There is no influence on cell activity and the producing process can be shorten, so the cost will be reduced as well. Besides, Attachin can make a less possibility of being contaminated by pathogens or protein on condition that the decrease in using serum, so the purification can be simplified.